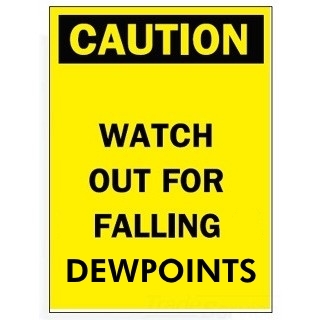 Heat Warning tomorrow, then watch for falling dewpoints! 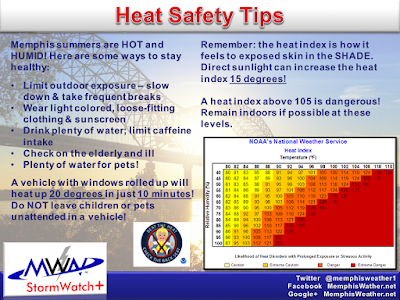 As of early this afternoon, temperatures climbing into the mid 90s and high dewpoints (a measure of humidity) combined to meet the NWS definition of excessive heat (heat indices of 110°+), and the Heat Advisory that was in effect was upgraded to an Excessive Heat Warning. 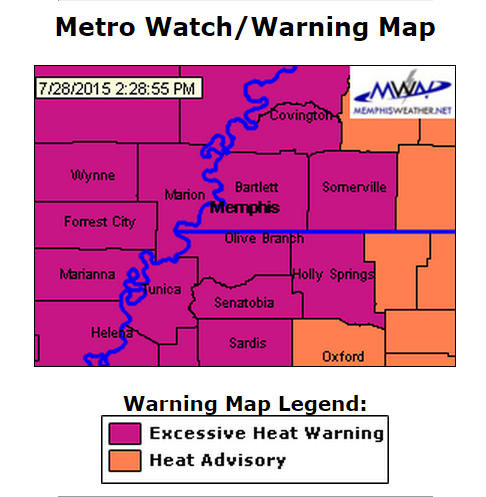 That warning continues through 8pm Wednesday, as we have one more very hot and humid day to deal with tomorrow. In fact, there's little relief overnight as the projected low in the city is 81°, which would tie the record warmest low temperature for July 29. You've no doubt heard about the cold front that will move through the region Wednesday night. 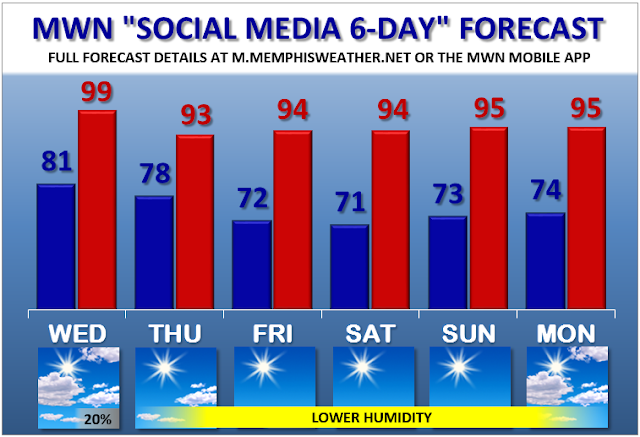 Many times in the summer, moisture and heat "pool" ahead of these fronts, resulting in hot and humid days. This is exactly what we expect tomorrow as temperatures once again reach the upper 90s with dewpoints in the mid 70s to near 80 in some spots in the Delta, making it feel much like it did today, if not a bit hotter! 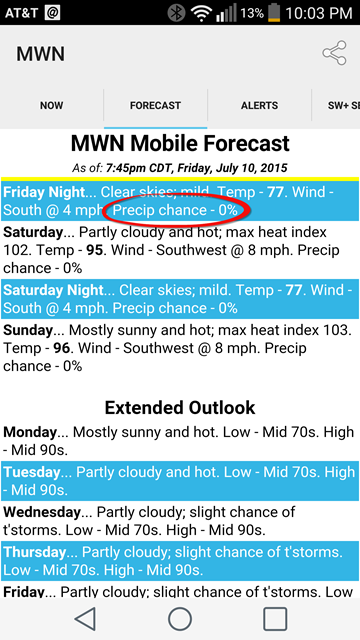 So what about rain chances? Unfortunately, it appears the best chance of thunderstorms will remain to the east of the metro with only a slight (20%) chance locally on Wednesday and Wednesday night. 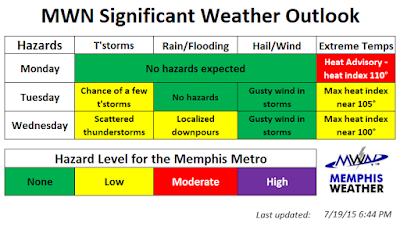 Part of the reason for the low rain chance is that upper level high pressure will continue to be strong, limiting the support for storms, despite the presence of a front. Even the front itself will have little in the way of converging air along it, which would typically aid in making the air rise and increasing chances of storms. 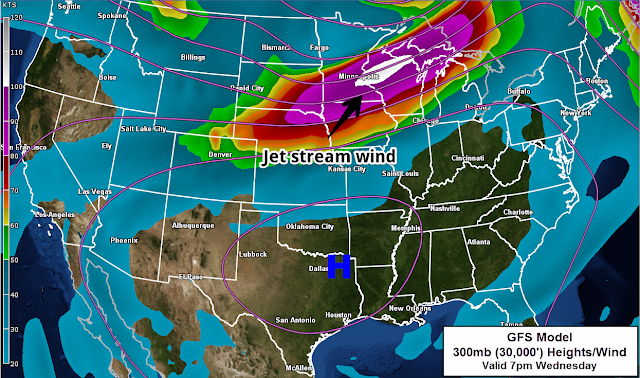 The GFS computer model forecast at the jet stream level Wednesday evening shows the strongest wind well north of the area and a broad area of high pressure over the south-central U.S. The strong high will prevent any organized storms from affecting the region as the cold front passes. The good news arrives Thursday as the front clears the area and drier air begins to push into the region. Temperatures will also peak about 5-7° lower than ahead of the front, so although it will still be hot (lower 90s), dewpoints will be a good 10° cooler, in the mid 60s. 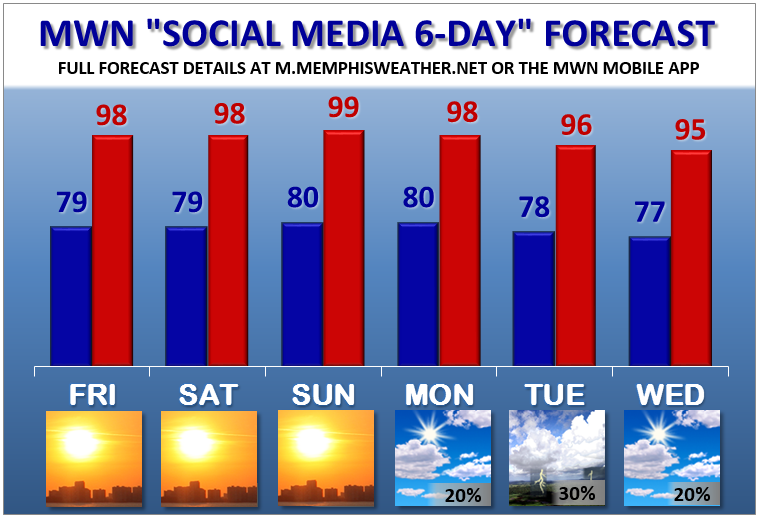 So rather than feeling like 110°, low 90s will FEEL like low 90s! I think we can live with that! Looking towards the weekend, although temperatures will remain near or slightly above seasonal norms (lower to mid 90s), dewpoints & afternoon humidity values will remain below normal, so it should be a little easier to get the yard work done or get in a run! The long-range outlook continues the hot pattern into next week but with continued mid 60s dewpoints, thus heat indices should remain below the danger levels seen the past couple of weeks. Be conscious of the heat for one more day, then we can look forward to hot without the humidity! 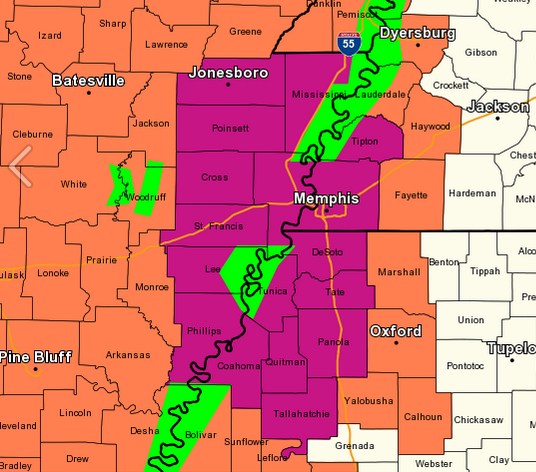 An Excessive Heat Warning has been issued for the majority of the metro (Fayette County is technically under a Heat Advisory, but I'm not quibbling when the heat index has reached the danger level). The Excessive Heat Warning is in effect until Sunday at 8pm, but I have high confidence that we'll see it extended, possibly through Wednesday, before a front finally starts to move in our direction by week's end. Excessive Heat Warning through Sunday in pink, Heat Advisory in orange. 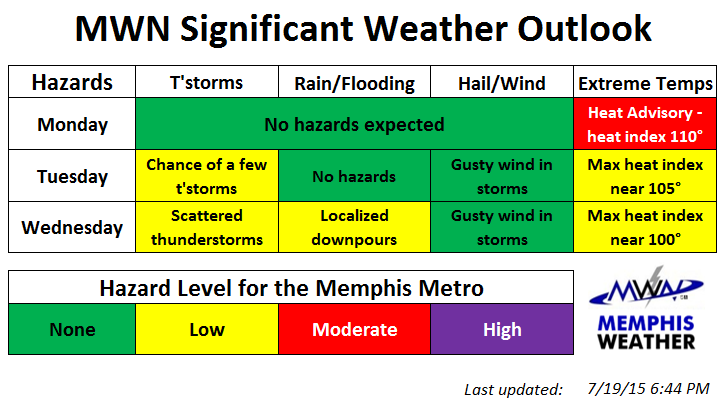 Graphic courtesy NWS-Memphis. After a short break from the mid and upper 90s (but not the high humidity) earlier this week, plus a few rounds of strong thunderstorms, upper level ridging builds anew and can be thanked (or cursed) for pushing temps back into the mid 90s to near 100 for the next several days. 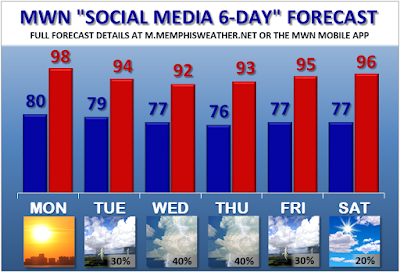 Rain chances are minimal to nil through Wednesday as well. These are the dog days... woof. 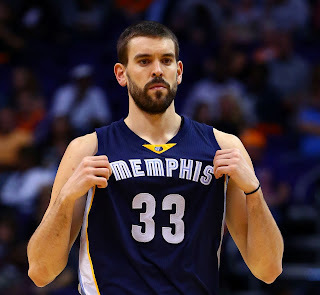 Perhaps this will make you feel a little better Memphis! 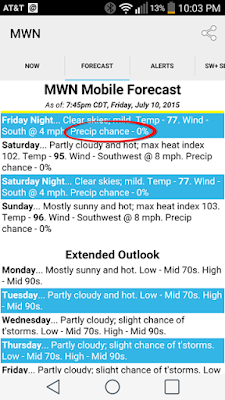 So, besides hot temperatures, why are we seeing heat index values near or above 110°? 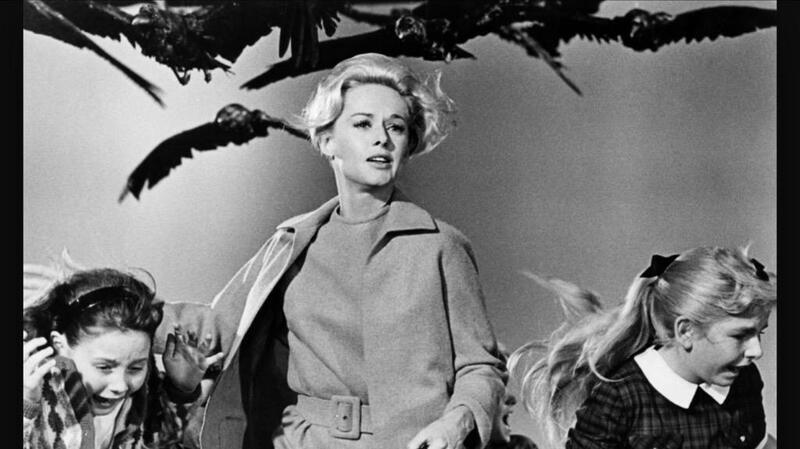 Maybe you've heard this before: "It's not the heat, it's the humidity." (Well, in this case, it's the heat too. Let's not kid ourselves!) But there is truth to that statement. Let's look a little closer at humidity. When humidity values are reported, it's actually "relative humidity" that we're talking about. It's relative to the temperature. For instance, if you track humidity during a normal day, you'll see that it peaks around sunrise and bottoms out in the late afternoon. 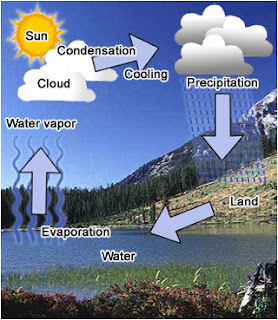 However, even though the air is closer to saturation when relative humidity is highest, relative humidity doesn't actually tell you how much water content is in the air. Besides temperature, water content is the most important factor in determining how "uncomfortable" it feels. Consider a calm, clear spring morning with temperatures in the mid 50s. The relative humidity is 90%. Now consider early this morning, with temperatures near 80 and relative humidity of 80%. In our example, the humidity was 10% lower this morning, so it wasn't as sticky as our spring example morning right? Wrong! Behold, I give you the more appropriate measure of water content (and uncomfortability - yes I made that up): DEWPOINT. Dewpoint is the temperature to which air must be cooled to be saturated (or achieve 100% relative humidity). 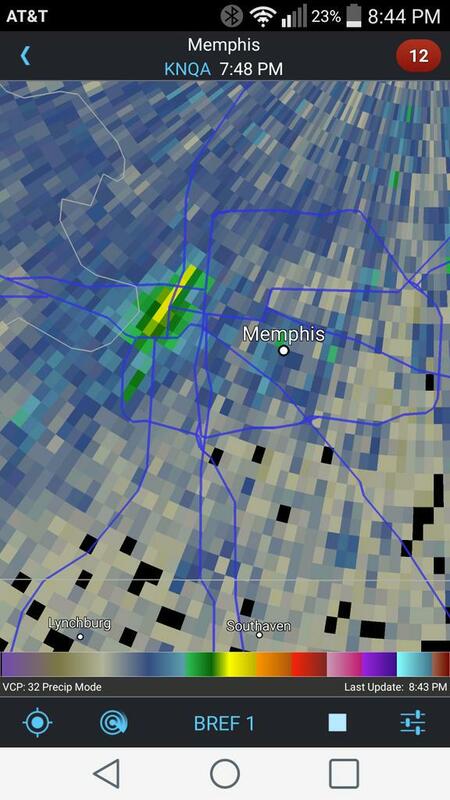 Let's look at yesterday's observations from Memphis International Airport (below). 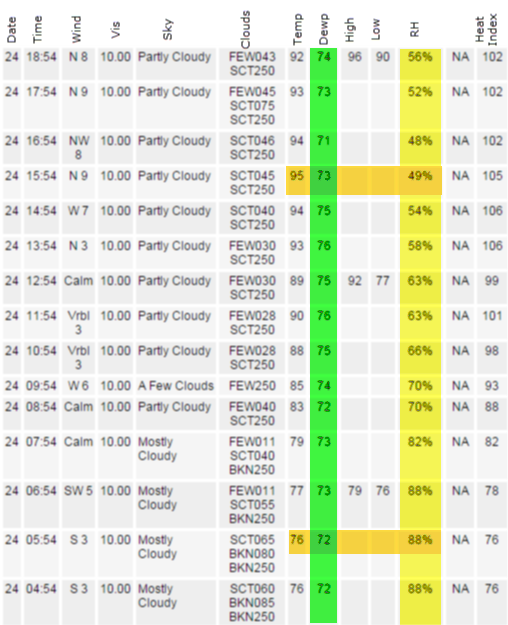 Notice the humidity (yellow highlight column) falls from 88% in the morning when the temperature was 76° to 49% in the afternoon when the temperature was 95° (orange highlighted rows). That humidity value is "relative" to the temperature. Did the amount of water content in the air change from one time to another? Barely. We know this by looking at dewpoint (green highlight column). It was 72° when the temperature was 76° and 73° when the temperature was 95°. It inched up 1°, thus the amount of water content of the air changed very little. You'll also notice that the dewpoint is generally is more consistent (in the 72-76° range all day) than relative humidity, which varied from about 50-90%. So, you say "50% humidity doesn't sound all that high!" Did you go outside yesterday afternoon? The air felt very humid! 50% in the morning is low humidity, but 50% in the afternoon is high! Dewpoint helps straighten all this out, since it measures the amount of water vapor in the air no matter the temperature! Dewpoints above 65° usually cause people to start to notice the "humidity" in the air. Dewpoints above about 72° are very uncomfortable and when a dewpoint reaches the upper 70s to near 80° it's best to just avoid the outdoors altogether, especially if you have health issues! The amount of water vapor in the air at a dewpoint of 80° is so high that it can cause heat illness fairly quickly for those who aren't taking every possible precaution. It's rare to see dewpoints this high at properly sited professional equipment that is well-maintained and in open areas, such as at large airports. 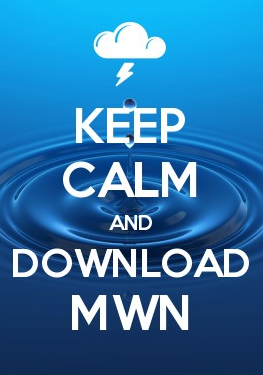 However, in the MWN backyard, the grass is green and thick, moisture is constantly evaporating due to the heat, and there is less mixing of the air due to being sited in a neighborhood with obstructions. Even with well-maintained semi-professional equipment, the dewpoint has been reading 80° recently. I can assure you, having to mow that green thick grass that I can feel every degree of that ridiculous dewpoint! The sweat does little evaporating with that much moisture already in the air. MWN's Bartlett reporting station, surrounded by grass and slightly sheltered by fences. These factors contribute to a higher dewpoint in this locale than at the airport. So when someone comments on the humidity from now on, you can take a mental note that it's actually the dewpoint that determines how uncomfortable it feels! 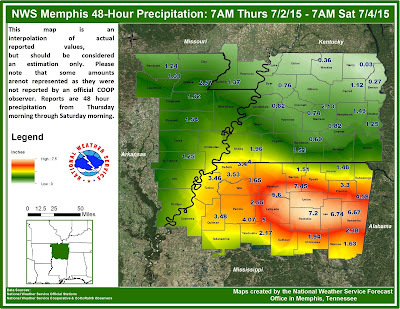 Total projected rainfall through Friday, as predicted by NOAA's Weather Prediction Center. The Mid-South will hopefully see widespread amounts of 1/2-1". 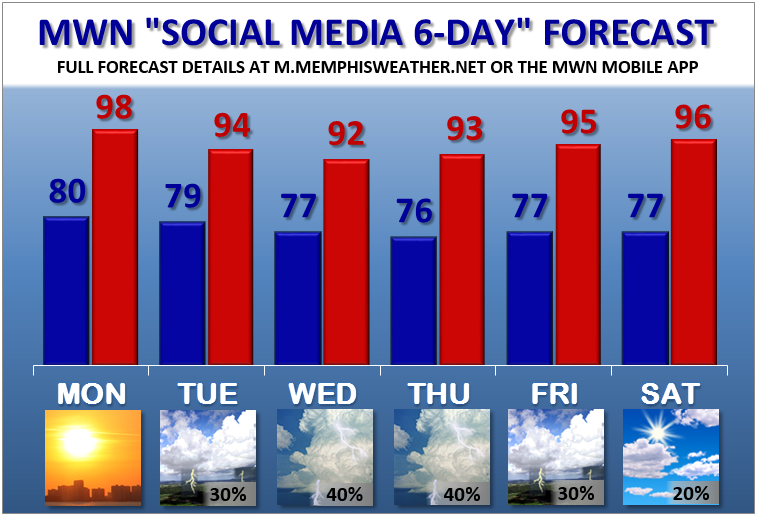 The main hazards the next few days will be heat Monday and scattered thunderstorms towards midweek. Temperatures have been heating up the past week as broad high pressure at the upper levels of the atmosphere has built over the region. Though not atypical of summer in the south, humidity levels have also been high, which has prompted daily Heat Advisories as heat indices have topped out in the 105-115° range. High temperatures during the current heat wave. 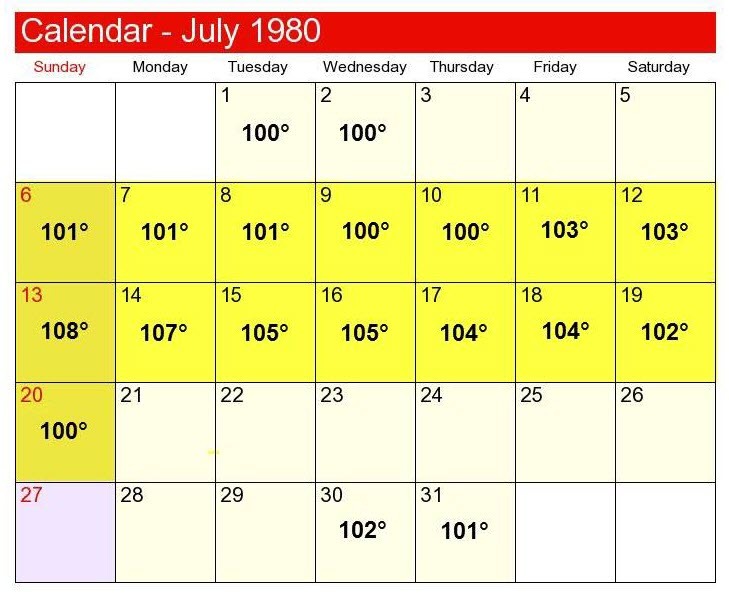 However, for those who have been around the Mid-South their whole life (or at least the past 35 years), you'll recall the wicked hot summer of 1980. During July of that year, there were 19 days with highs at or above 100°, including a record stretch of 15 consecutive days. 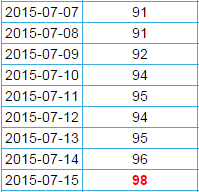 That was also the year that the all-time record hottest temperature occurred in Memphis - 108° on July 13th. 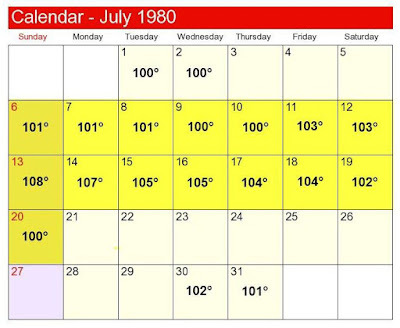 High temperatures at or above 100° during the summer of 1980. Earlier this week, a series of convective complexes made their way through the Midwest in the "ring of fire" - the zone around the periphery of the high that convective systems follow. While most of these stayed to the east of the Mid-South, a small cluster of storms formed in eastern KS and tracked through southern MO into northeast AR and across the metro on Tuesday night. As the storms reached the Mid-South during peak heating, they encountered a highly unstable airmass. The result was a summer storm that brought widespread 50-60 mph wind and many smaller pockets of 60-70 mph wind to the metro. In fact, an 87 mph gust was recorded in Atoka in Tipton County! Nearly 30,000 MLGW customers were without power after the storm and tree debris (in some cases whole trees) littered the landscape. A video of the radar data from that storm system is shown below. Notice also that storms fired up quickly in the late afternoon heat to our north, in an east-west fashion ahead of a cold front that remained to our north. The high pressure system has re-established its hold on our weather now though and it appears to remain entrenched right through the weekend. 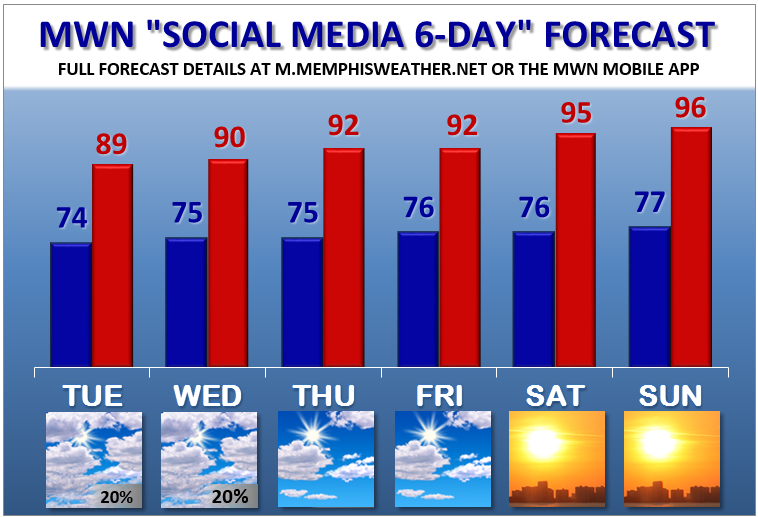 Thus we will see more mid to upper 90s highs, lows barely below 80, heat indices in the danger category, and nearly a zero percent chance of rain right into early next week. By Tuesday/Wednesday, the ridge weakens a bit again (similar to earlier this week), which could allow for some airmass "popcorn" thunderstorms ahead of a weak front on those days. And just like earlier this week, the front itself will not move south of us. Thus cooler temperatures and lower humidity will again have to wait. Early signs are that the ridge of high pressure once again establishes itself over the region to end next week and temperatures remain well above normal as we head towards the end of July. Unfortunately there is little in the way of good news for those who like a break from the heat and humidity of the "dog days" of summer! We remind you that the effects of heat are cumulative - the longer it stays hot, the less capable people are of tolerating it. This is especially true for the youngest children, our older adult community, and those with medical conditions. Also, don't forget about your pets! 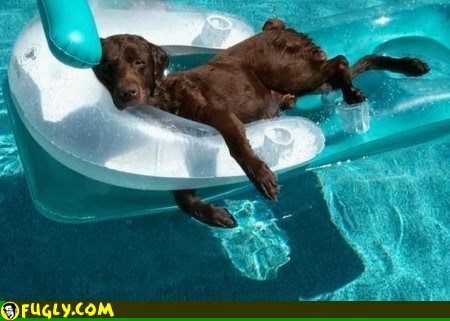 It may be the dog days, but that doesn't mean your canine friends enjoy it more than you! 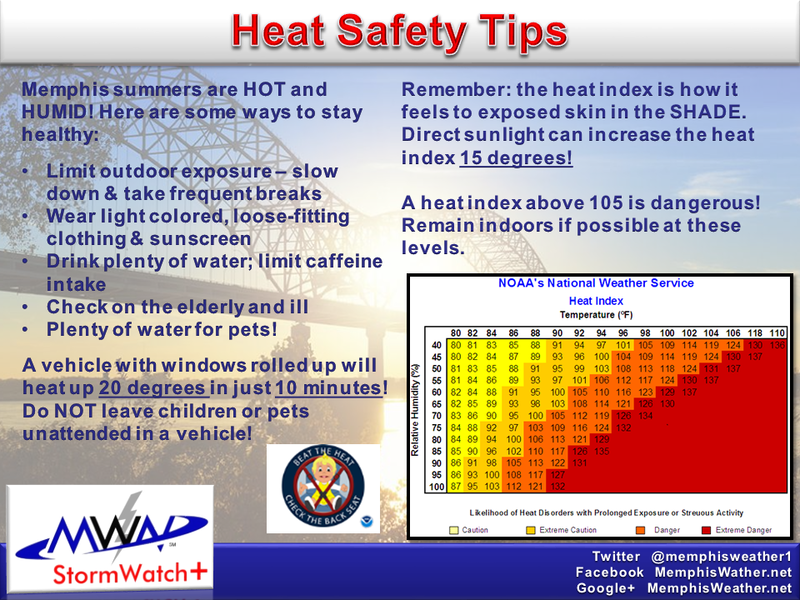 Our complete guide to staying safe in the Memphis heat can be found here or check out the tips below to stay safe, if not completely comfortable, during these hot days! I've ranted before on the uselessness of "crap apps" and that ALL weather is local, therefore your weather information sources should also be as local as possible. A classic example was placed in my lap last night. Being a prudent and thorough groundskeeper, he is apt to check multiple sources of weather information, even on calm nights. When he came across the forecast above, with its elevated rain chances, he checked radar and noticed an echo over downtown. With a forecast of rain from that app (I don't mind calling it out - The Weather Channel) and the radar image with an "echo" on it, plus the knowledge that it wasn't supposed to rain, he reached out to me. I then grabbed the screenshot below from RadarScope. Radar reflectivity showing a region of enhanced returns over downtown, which were persistent for perhaps an hour Friday evening prior to sunset. I was obviously cynical, but also curious, so I did some additional radar interrogation, including looking at one of the new dual-polarization products (correlation coefficient, or CC) shown in the right panel below. 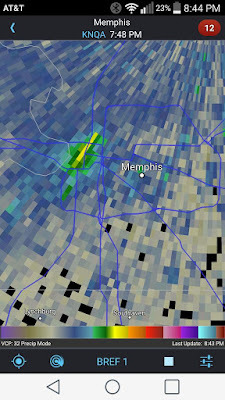 It shows blue colors co-located with the reflectivity returns on the left indicating SOMETHING present in the air. The bright blue colors are low CC values, meaning it was NOT precipitation being detected. The objects being detected were non-uniform in shape/size. 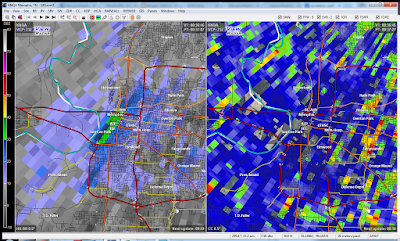 Radar reflectivity (left) and correlation coefficient (CC - right). 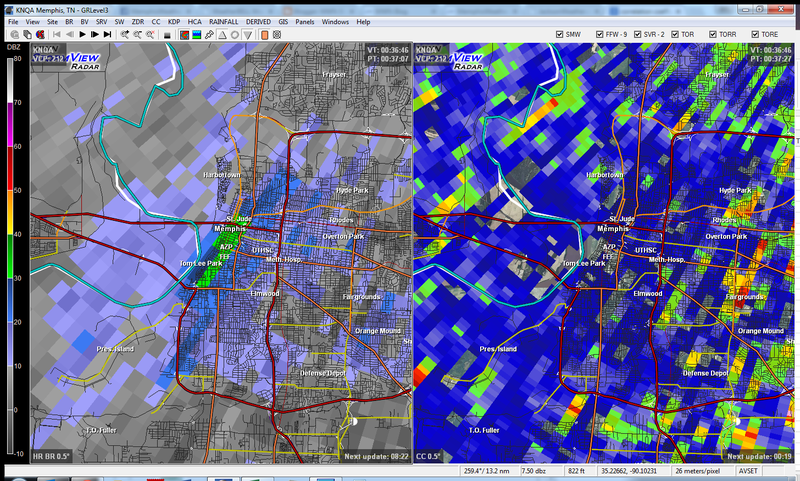 CC values indicate that the returns over downtown were not precipitation, but objects of irregular size and shape. I returned a message to the groundskeeper, assuring him there was still a 0% chance of rain and that his national app was wrong (surprise, surprise). To me, it appeared that the radar was picking up on waterfowl returning to roost for the night on the banks of the river near downtown. I have seen this before (on a repeating basis in fact) just before sunset in roughly the same place. I believe Mud Island is a favorite "home" overnight for birds and have had some corroboration of that fact from downtown residents in the past. 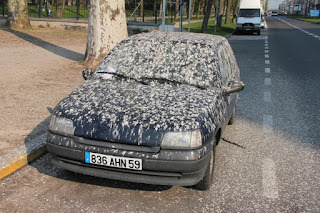 What is the chance that these birds are detected by Doppler radar? About 59% apparently. So what to make of the crap app with the 59% chance of rain? Most national apps use a single computer model for their forecast, which results in not only a POOR forecast when the model isn't performing well, but one that is also very inconsistent, often changing several times a day. In the case of The Weather Channel app, I understand that it is a little more sophisticated and actually performs slightly better than the typical national app. So what do I THINK happened? Though I can't prove it, I believe that TWC's app picked up on the radar echoes around downtown and "smartly" adjusted the rain chances for the first couple of hours of the forecast! 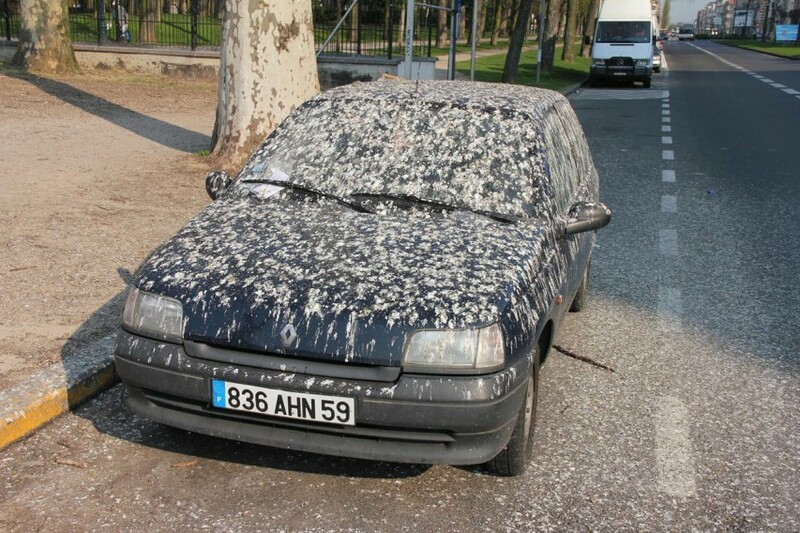 If this was indeed birds that tripped the app up, it gives a whole new meaning to the term "crap app." 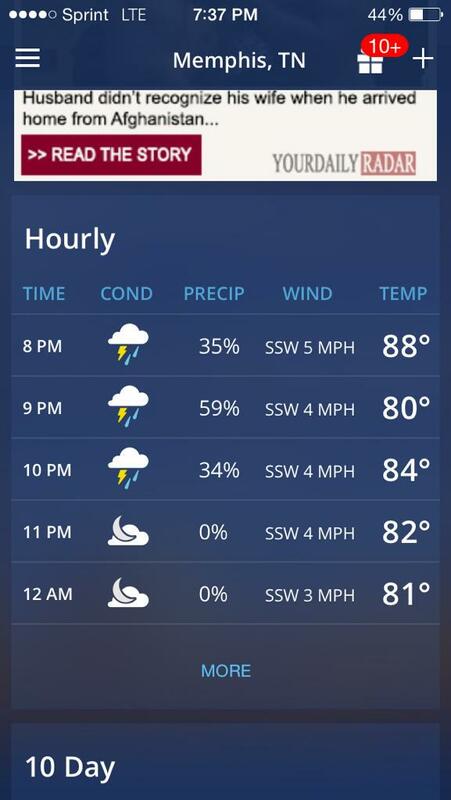 By the way, as opposed to the crap app, I never changed my forecast from the original 0% chance of rain. That's the difference between using a national app and shopping local. 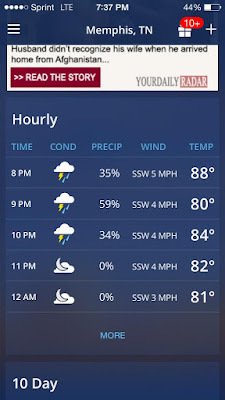 MemphisWeather.net's app and the forecast contained therein are HUMAN-POWERED. I write the forecast, using all available model data, plus intuition, local knowledge and experience. Most of the time, that will result in a much more accurate product and one that is definitely more consistent. I think that's worth far more than the $0.99 I charge for it. Check it out for yourself. 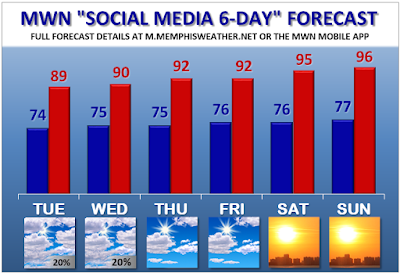 Temperatures and precipitation were above normal in Memphis in May and that trend continued in June. In fact, daily average temperatures were at or above normal for 22 consecutive days during the month. Precipitation was below normal until a deluge of more than 2" to end the month. However, most of the metro was below normal for the month. 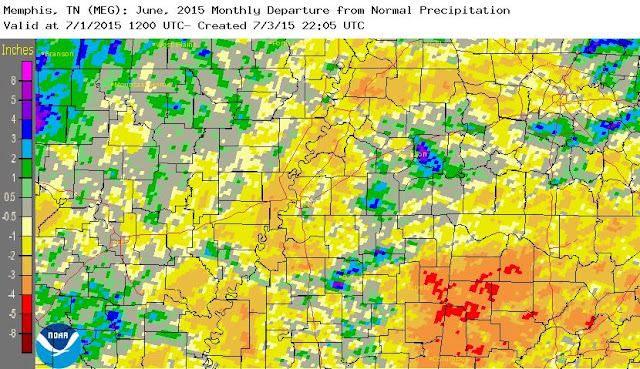 Through the first half of the year, Memphis International Airport still has a year-to-date rainfall deficit of 3.22", or about 88% of normal. As far as temperatures go, the year-to-date average temperature is 1.1 degrees below normal. Both of these numbers are trending closer to normal though over the past few months. Despite above normal precipitation at the airport, most of the metro was below normal for the month of June, some areas by a couple of inches. There were a few rounds of thunderstorms in the metro with scattered severe weather reports. 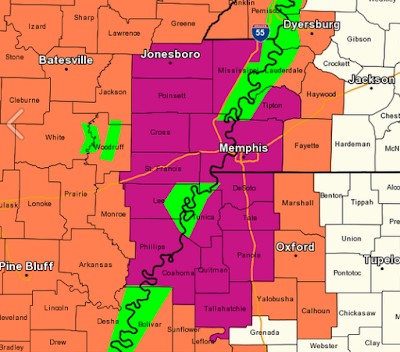 Wind damage reports were received on the 9th and 26th in the metro and on the 24th in Tunica County. There was also both hail and wind reports in the metro on the 30th. Comments: Every day from the 5th through the 26th was above normal, bookended by below normal temperatures to start and end the month. Comments: Over 2" of rain on the 29th resulted in a drier than normal month ending wetter than normal. It was the only day with more than 1" of rainfall for the month. It was also the second wettest June 29th on record behind the 5.87" recorded just one year earlier in 2014.